For most of my life, I never really had a morning ritual. Well- I never had a morning ritual that went much beyond putting on my makeup and getting my hair into some sort of acceptable outside-world style. Then, as I went through my twenties, I started adding new parts to my morning ritual. I got into making green juices in the morning, and then- even better- I got into making green smoothies. I purchased a french press and started making my own coffee every day as well. Lots of liquids. And then I figured out a way to style my hair even quicker than before (by forsaking straightening my crazy waves into heat-damaging oblivion every single day). This summer, I hit a wall. I was sick of the days passing me by while some of the most important things I wanted to do daily remained undone. So I started a ‘most important things on my list are the first ones’ habit. And it really started to work. I’d get up, start some coffee, eat an apple, and meditate (which is very important to me). Then I’d put on my gym clothes and go running or to the gym (also very important). Then I’d come back, make a smoothie, and tackle my to do list or go to work. In this way, I was meditating daily and also getting to the gym before interruptions took over. The first thing in the morning habit really worked. Even though I’m a night owl. The hardest part has been expanding my morning ritual into other important tasks. It was easy to meditate and run and then get through a to-do list of smaller items like ‘wash dishes. email so-and-so. send invoice.’ It was much harder to meditate and run and then tackle larger and more important to dos like ‘rewrite resume. practice presentations. watch videos and research new job prospects.’ I was just talking to my friend Janna about this; For whatever reason, the reallly important tasks that could further our lives and careers have been getting pushed by the wayside and out of our days entirely. And this has been happening for a while… kind of sort of like always. Especially on work days where there’s not much time left in the day to tackle tasks other than getting to work. Our new idea has been to start using the ‘first thing in the morning’ ritual to include these big important tasks right away…and I think it’s best to only focus on one Very Important Task daily. So to recap, instead of trying to kill a whole to-do list, I’m going to prioritize one big important task a day and only try to do that, starting in the morning. First, I’m still going to start my coffee and have an apple and meditate. Then I’m going to work on the chosen task for an allotted period of time. Only THEN will I tackle the other items. I think choosing only one large item a day to work on first thing in the morning is helpful. When there’s only one thing to think about, it’s easier to stay focused and not accomplish absolutely zero big important tasks in a day. What do you think? 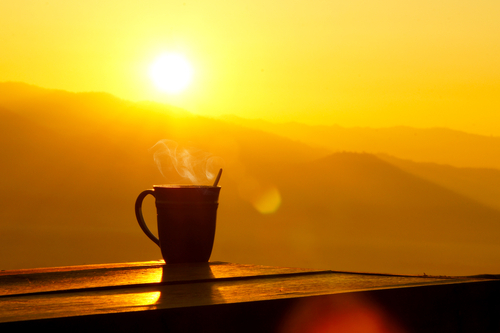 Do morning rituals help you? How do you accomplish the really big important tasks and not let the days pass you by? I love when convos become blog posts! I’ve almost been thinking about planning my morning to the hour. That way when 11 am rolls around, you’ve already had quiet time and run and you feel like nap time, the Most Important Task of the Day time is already on the books from 11-1. Gonna give that a try tomorrow.. Would love to know others’ tricks.. Thanks Janna! And thanks for bouncing the idea around with me! Let me know how your 11-1 plan goes! When I was working I used to assign letters to different tasks. For example; an “A” task had to be done that day, a “B” task could wait until tomorrow and so on. However, a “B” task became a “A” task the next day and a “C” task became a “B” task. It ensured that I got the important stuff done first. I also tried to save time but grouping tasks together. Like doing my banking on my way out for lunch. No point in returning phone calls during lunch hour and playing telephone tag. Time is money when you are self employed. I love this idea, Rico! In this way, you finish a task before starting the next! Mornings are so hard!!!! I try to focus on one big task a day and try not to let the more menial tasks get in the way. It’s a struggle though!! It’s great that you’re trying though. I think the first step is to be aware of it! Thanks, Audrey!! !